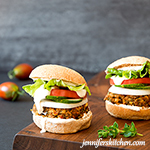 Summer is almost over (sniff), so I find myself squeezing in as many fresh tomato and basil recipes as possible before the chilly winter winds whirl in and whisk all the tender garden produce away. This mayo-free salad is rich in fiber and protein and is super easy to make. You can use canned garbanzo beans if you like (which would sort of make this a no-cook recipe), but I love the taste and texture, not to mention the money saving factor, of beans cooked in a crock-pot or slow cooker. If you need a little refresher course on this, check out the post I wrote on how to cook beans in slow cooker. 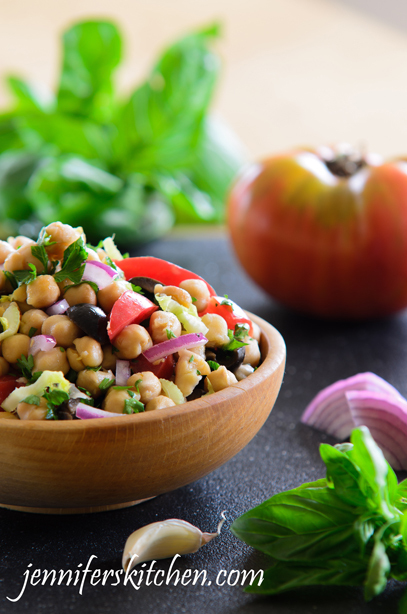 This Greek Garbanzo Salad is very filling, low in calories, high in fiber, and loaded with nutrients making it a great recipe for weight loss. 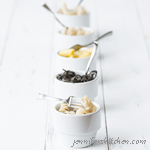 Mix together garbanzos, diced onion, diced celery, olives, and lemon juice in a large mixing bowl. Finely chop parsley and oregano and mince garlic. (A food processor works well for this.) Stir into garbanzos. Stir in oil and salt. 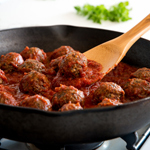 Immediately before serving, stir in tomato and fresh basil. The amount of salt needed will depend on the amount already in beans. This sounds good. 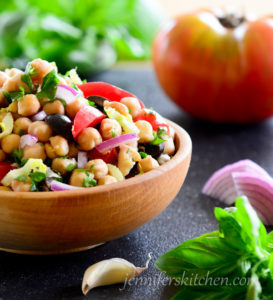 I love the combination of garbanzos, tomatoes, and red onion. All the other ingredients are just “gravy”, so to speak. Very nice. I definitely appreciate this site. For anyone who doesn’t want to use oil, and wants to increase nutritional values could use your Creamy Italian dressing as a great substitution. You just need to adjust the seasonings in the recipe. Oh WOW. This looks incredible. Thanks for sharing.